I have been observing a supernatural occurrence in my life: oranges seem to multiply around me. I start off with two in the fruit bowl, which I’m sure I’ll get around to eating one of these days, and then look back a week later to find six instead. I throw away the first two, which are looking pretty pathetic by now, and think ‘I must start eating those oranges’. The following week there are eight. I go on a rampage some Sunday mornings, juicing the entire crop that is now threatening to squeeze all of the other poor fruits out of the bowl. That’ll show’em. But they begin again the next week, popping up like funghi. They’ve even started spreading to my office, where there are three sitting on my desk as I write. The funny thing is, I probably do eat 3 or so a week. It’s not like I’m neglecting the orange! But I need to find a way to cull them more frequently, because I HATE throwing away perfectly good food that could have been used if I had just had a little more time or imagination. 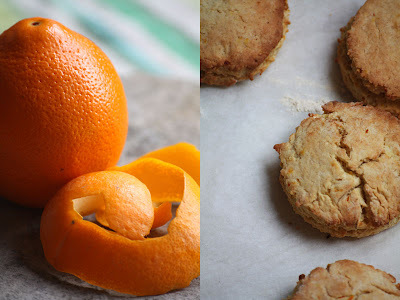 One of my favorite things to make with oranges is Nigella Lawson’s Clementine Cake, which is so ridiculously easy (you literally boil the oranges and then whiz them up in a food processor with the other ingredients, skin and all!) and is always a hit with my gluten-intolerant mother-in-law. Plus, it’s really good—moist, full of flavor, and not too sweet. 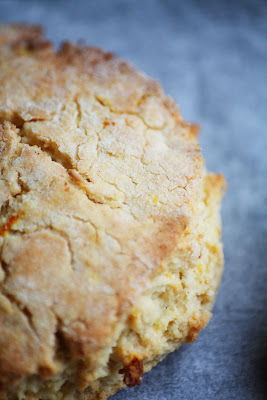 In this recipe I’ve used Nigella’s orange-almond combination in scones. My version is not gluten-free, but pretty yummy nonetheless. 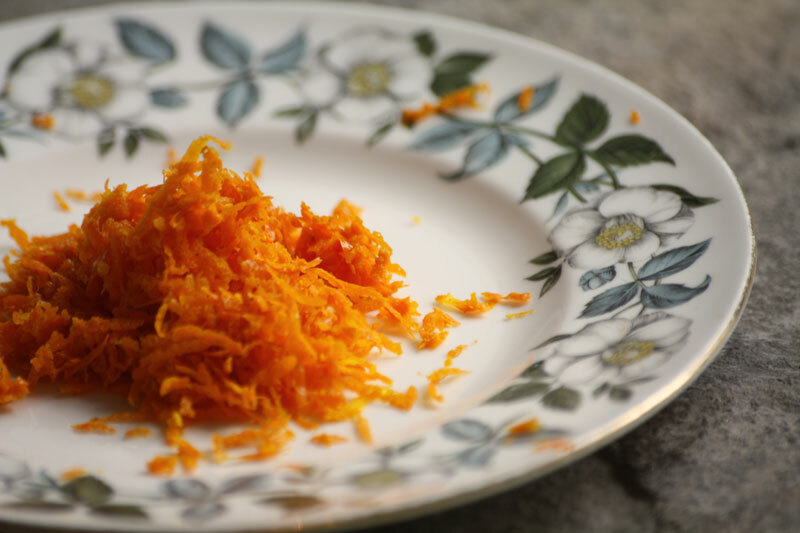 Do any of you have any good orange-based recipes I should add to my repertoire, before my fruit bowl spills over the kitchen counter? First mix your flour, ground almonds, and salt in a bowl, then rub the butter in until the mixture is like breadcrumbs. Add the almond extract, sugar, and orange zest and mix to combine. Then add your OJ and milk, but hold a little bit of the milk back just in case your dough doesn’t need it. You just want enough liquid to make everything hold together, but not so much that it’s sticky and wet. Tip: do not knead or overwork the dough. Just handle it enough to get it to hold together in a smooth ball, but no more. Press the ball out into a flat disc about 2cm thick, and use a round floured cutter (or if you don’t have one you can use the lip of a thin drinking glass) to cut out your scones. Take the trimmings and press them together to cut out a few more, until all the dough has been used. Bake on a cookie sheet lined with parchment paper at 220C/425F for 10-12 minutes.